The pictures with this post are not that great, my apologies for that. I am busy drafting the coat pattern today but when I saw the daylight start to fade ever so slightly, I decided to run downstairs and take some quick pictures of this little extra project I fitted in this week. The fabric I used this time is a cotton knit, it has the textured back of a sweater knit but it is, in fact, quite thin and not very stretchy. Those properties made it ideal for adding a collar. This thing now has the overall shape of my old top (just with a seam at center front, rather than at center back) and a collar which is rather similar to that of my pinstripe dress (which was unfortunately impossible to photograph in black-on-black). 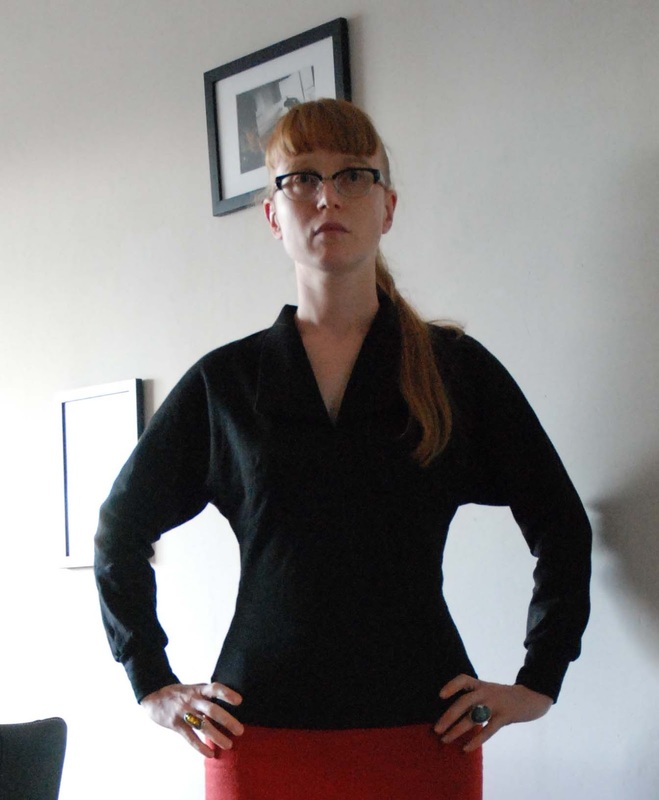 I cut it a little bit wider to compensate for the lack of stretch, lengthened the sleeves and added cuffs. In this fabric, the top works well worn over a skirt as well as tucked in, just as I hoped. Nice shirt! I really like the lines with your skirt. Your comment settings are very easy compared to some blogs where I have to try 2-3 times to get past capcha!